Every year since 2006, Meshbox Design creates a new set of 3D models for our Christmas Village series. 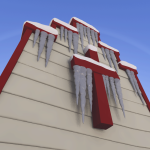 For 2014, to coincide with our forthcoming Wild West theme for Toon Santa, Christmas Village 2014 will feature both an Old West and Toon style. The first model in the Christmas Village 2014 set is Wild West Christmas Church. Wild West Christmas Church (and others this year) uses a more toon-like style, similar to Meshbox Design’s Halloween Bonehollow set (currently 20% off on Mirye Software). A few texture changes and you can use the models interchangeably in your scene. You will find more soft curves in the geometry, toon-like texturing and of course, removable snow! But not all the textures are simple. For example, there is a very nice ice-frosting transparent texture on windows. Also, this set has removable icicles with their own icy texture. 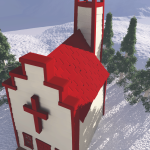 Wild West Christmas Church, like most Meshbox Design buildings, are fully textured AND furnished inside. 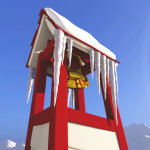 You get the church building, removable snow and icicles, a nice bell tower with a golden bell, and inside, even more. Step in and you find western style chairs, a podium with candle lights, a wall cross and a hanging candle chandelier. For Poser / DAZ Studio licensees, all doors can open / close, and all additional items are available as props. The list of available versions hasn’t been finalized yet, however you can be assured the following will be available: Poser / DAZ Studio, e-on software Vue, Shade 3D and Bryce. A version for game licensing is also available, and includes all formats as well as the original .max file. If you order directly from Meshbox Design or Mirye Software, you get the version you select and also get a .3DS file version as well.